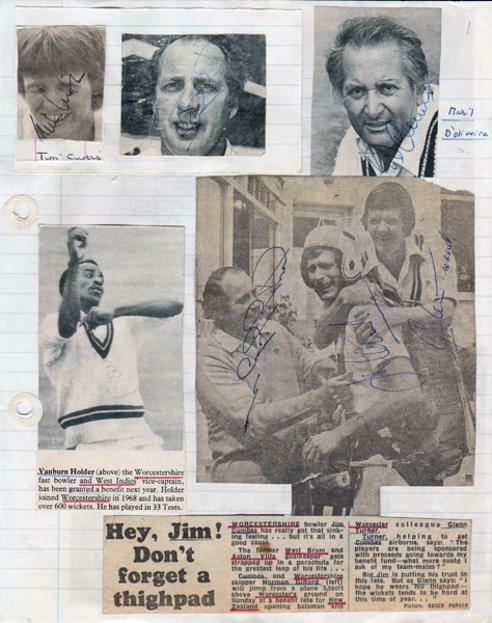 1970s scrapbook page (1) featuring B&W newspaper & magazine pics and articles signed by Basil D'Oliveira, Glenn Turner, Norman Gifford x2 , Jim Cumbes x2 & VanBurn Holder. 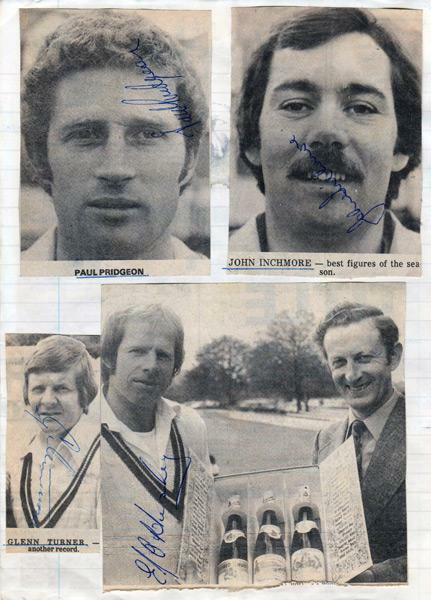 1970s scrapbook page (2) featuring B&W newspaper & magazine pics signed by Paul Pridgeon, John Inchmore, Glenn Turner & Ted Hemsley. 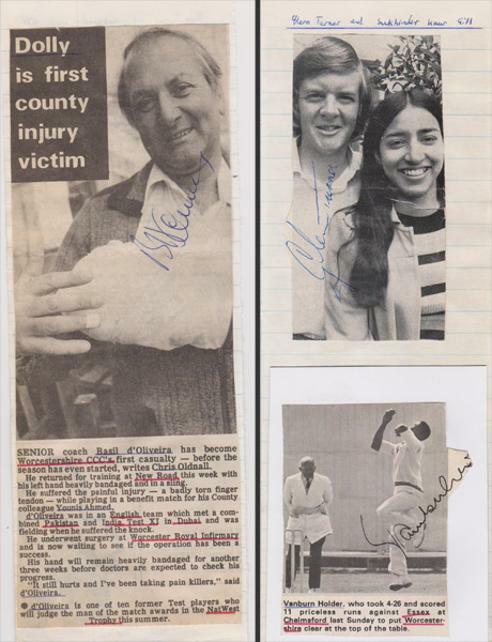 2 x 1970s scrapbook pages (3) featuring B&W newspaper & magazine pics & articles signed by Basil D'Oliveira (front) and Glenn Turner & VanBurn Holder (reverse). 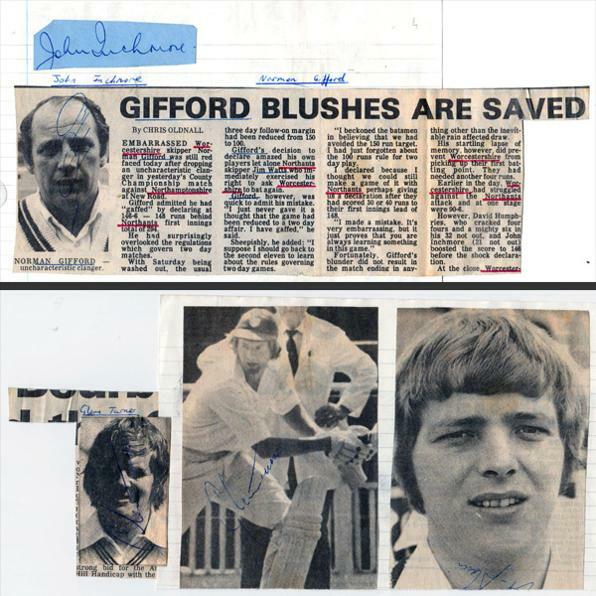 2 x 1970s scrapbook pages (4) featuring B&W newspaper & magazine pics & articles signed by Norman Gifford & John Inchmore (front) and Glenn Turner x 2 & David Humphries (reverse). 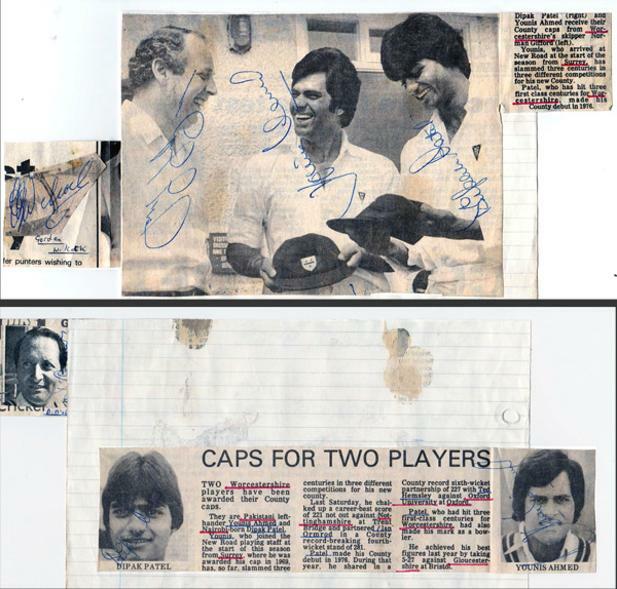 2 x 1970s scrapbook pages (5) featuring B&W newspaper & magazine pics & articles signed by Norman Gifford, Younis Ahmed & Dipak Patel on the latter two players receiving their county caps & Gordon Wilcock (front) and Younis Ahmed + Dipak Patel on receiving their county caps & Glenn Turner (reverse). 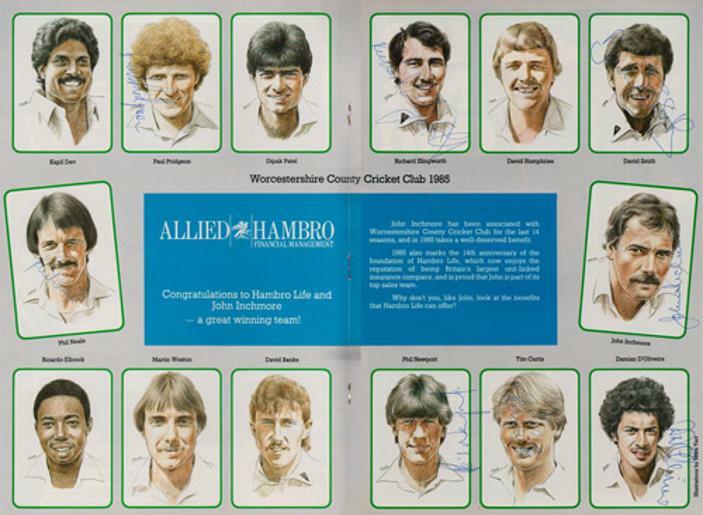 1985 double page team montage signed by eight players: Paul Pridgeon, Richard Illingworth, David Smith, John Inchmore, Damian D'Oliveira, Tim Curtis, Phil Newport & Phil Neale. 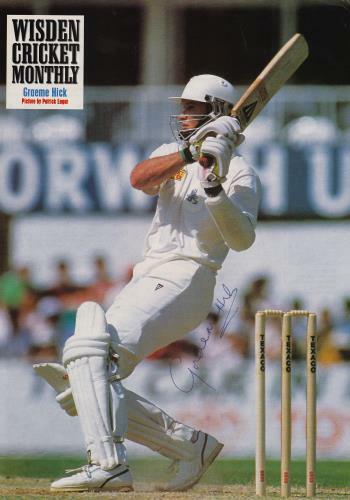 Signed colour magazine action pic. 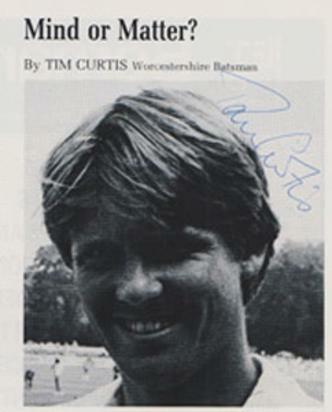 Signed B&W magazine article & portrait pic. 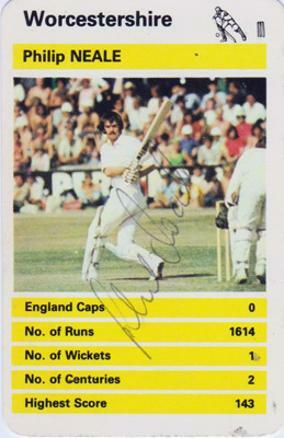 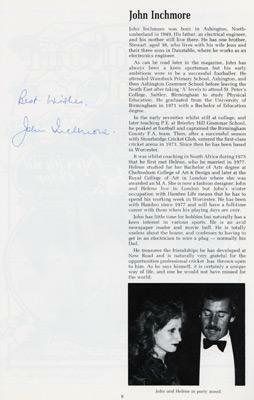 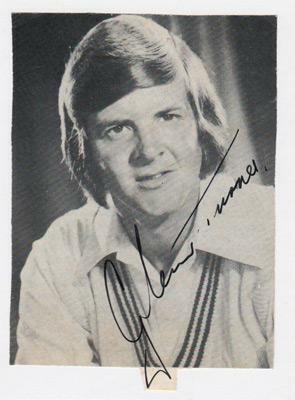 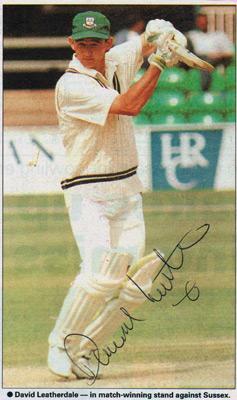 Also signed by Northants CCC team-mate John Inchmore. 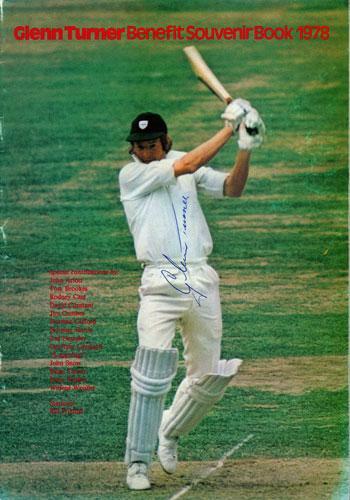 Signed B&W magazine action pic. 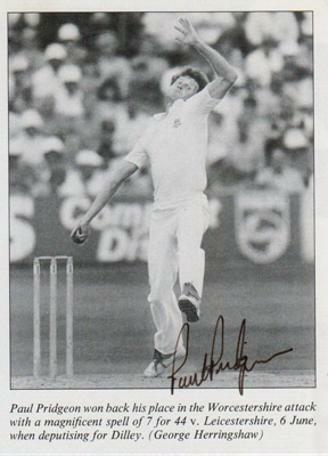 Signed Wisden Cricket Monthly full page poster pic. 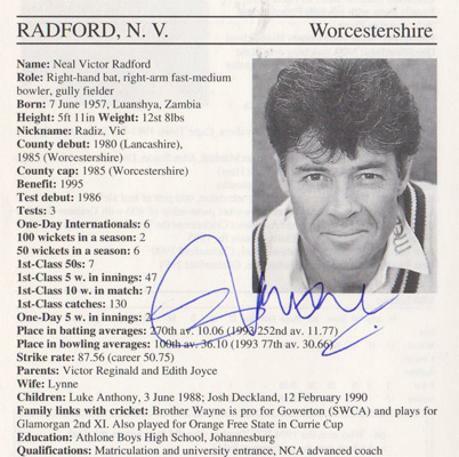 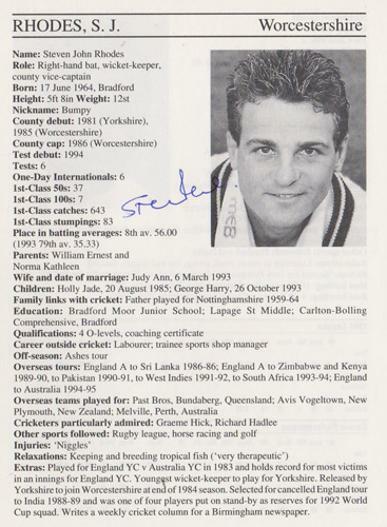 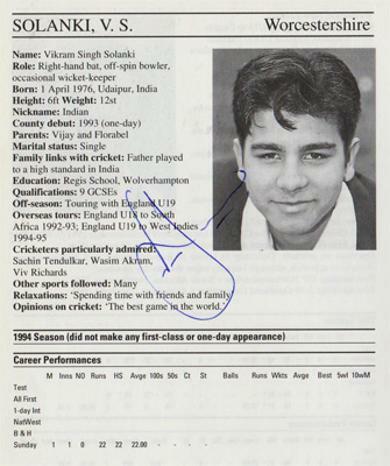 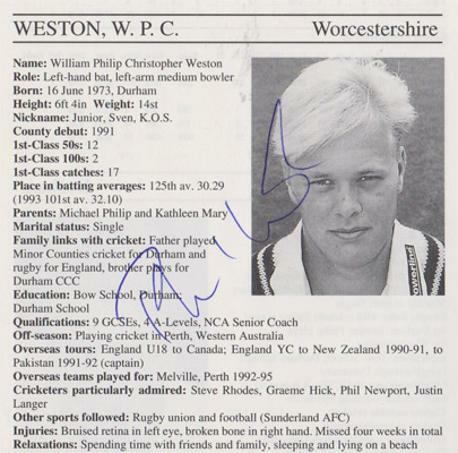 Signed 1995 Cricketers Who's Who bio entry page & portrait pic. 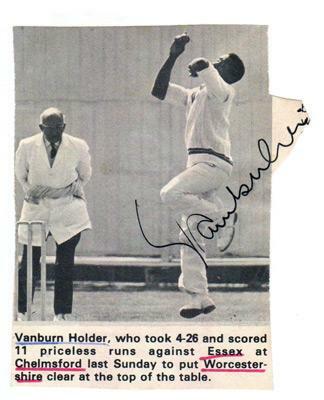 Signed B&W magazine action pic against Essex CCC. 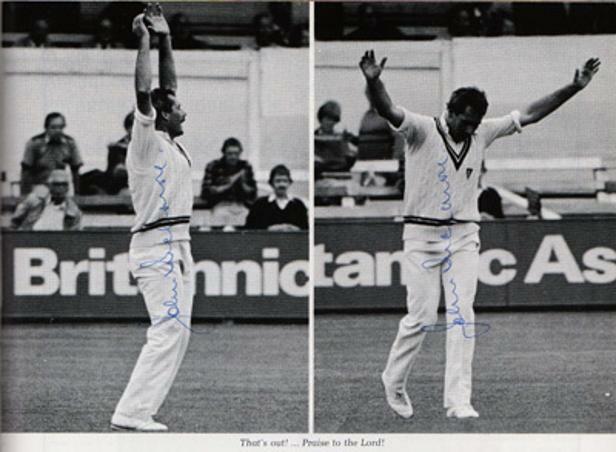 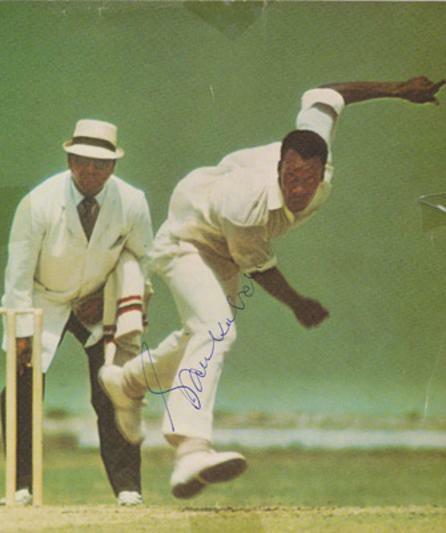 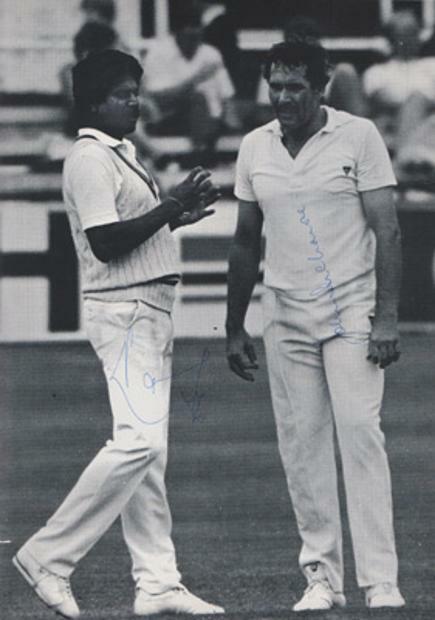 Signed colour magazine action pic - bowling for the West Indies. 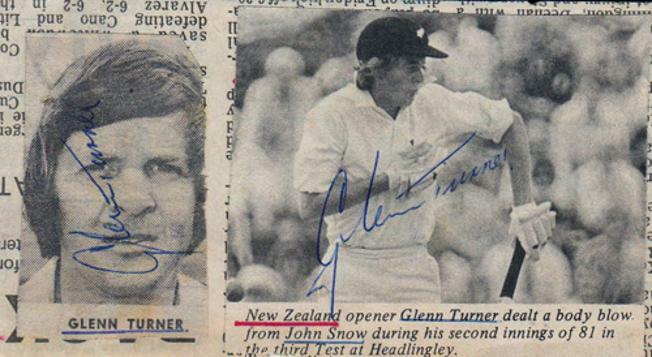 2 x Signed B&W pics. 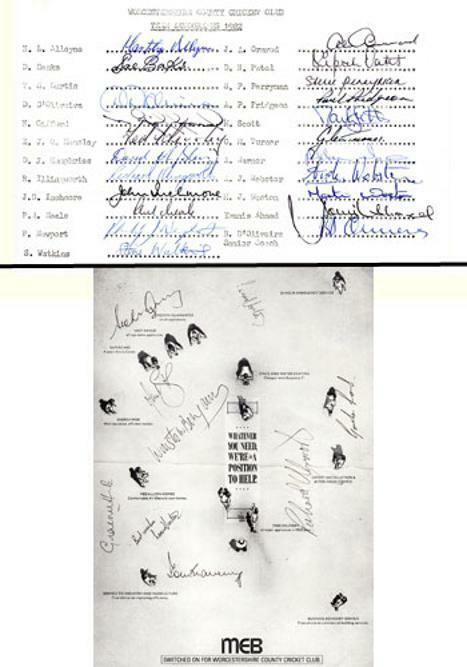 Signed 1985 Benefit Magazine page. 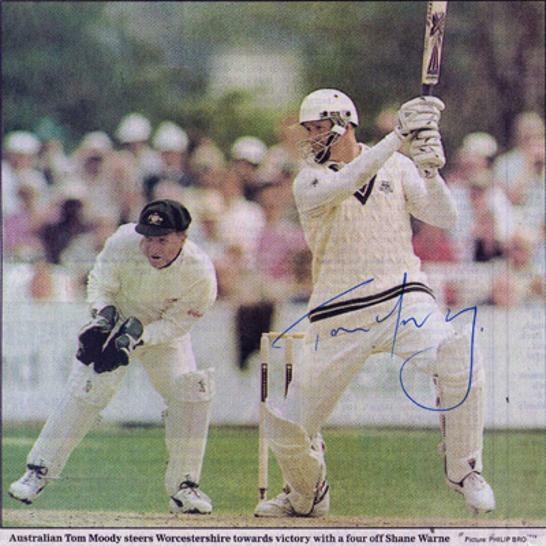 Signed colour newspaper pic of Moody batting for Worcs CCC against his native Australia and leading his county to a memorable win. 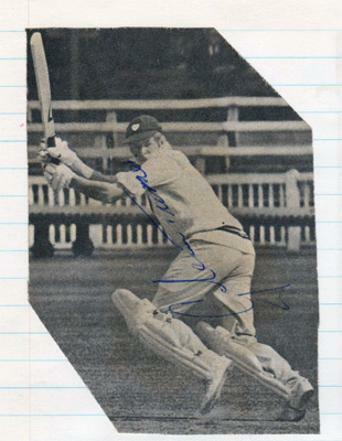 Signed B&W action photo batting. 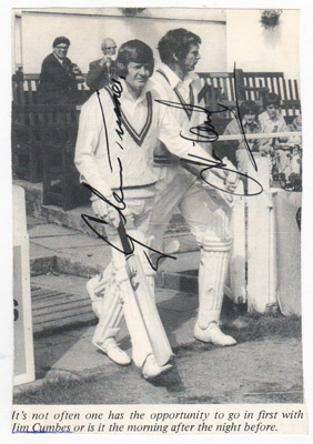 Signed small B&W action pic. 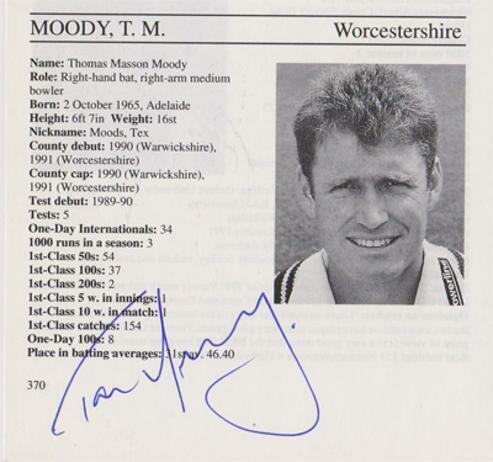 taking 7 wickets against Leics CCC. 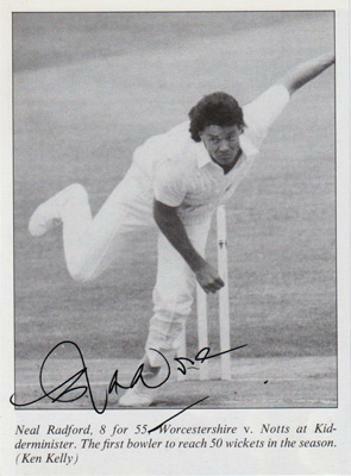 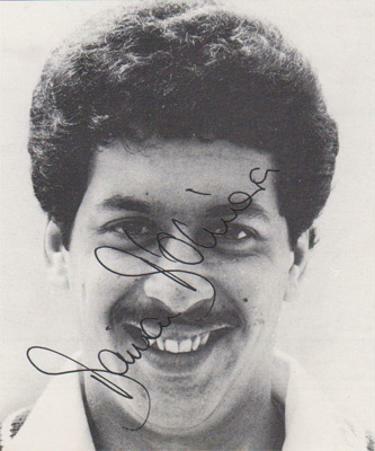 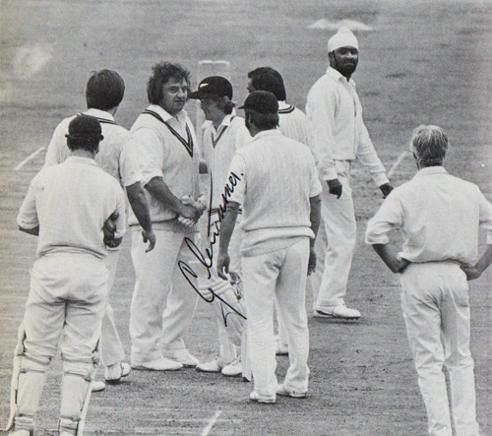 Signed B&W magazine action pic bowling - having taken 8 for 55 v Notts CCC to become first bowler to reach 50 wickets in the season in 1987.
batting for England against Australia. 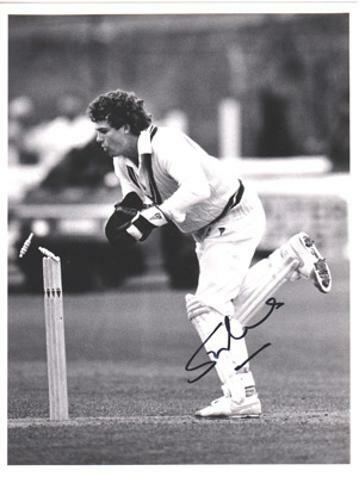 Signed B&W action photo showing Rhodes in full stumping mode. 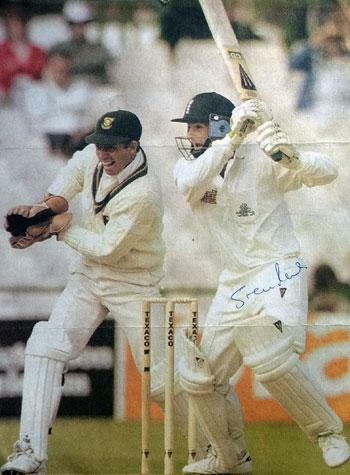 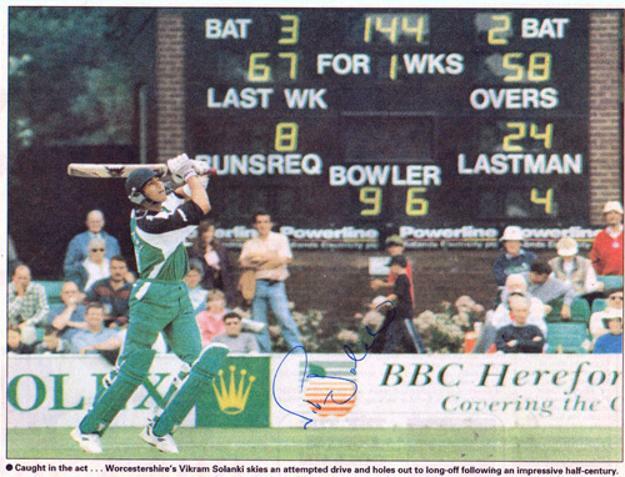 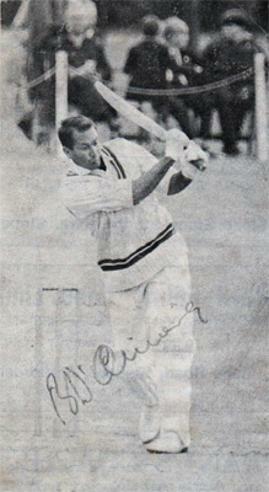 Signed colour newspaper action pic batting in a one day match. 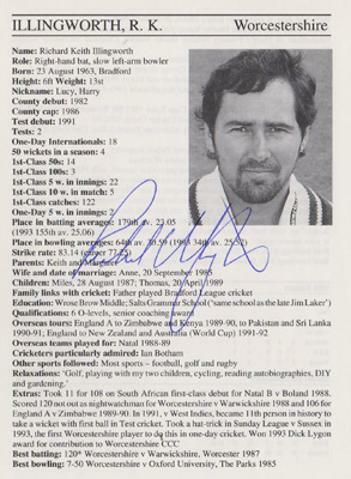 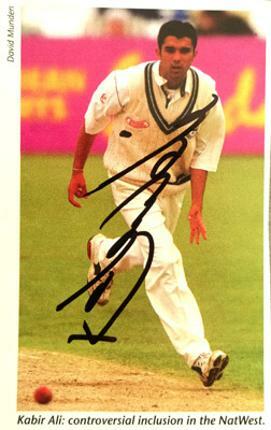 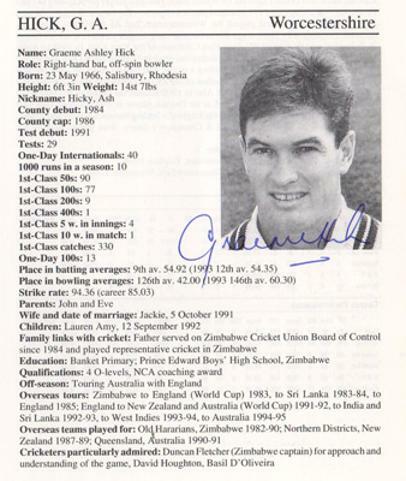 Signed 1995 Cricketers Who's Who bio entry & pic. 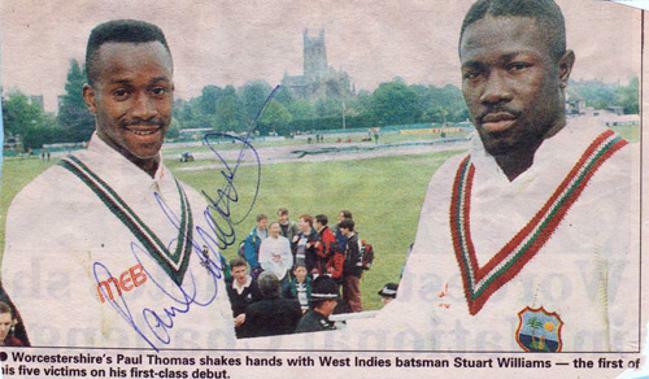 Signed colour pic and article. 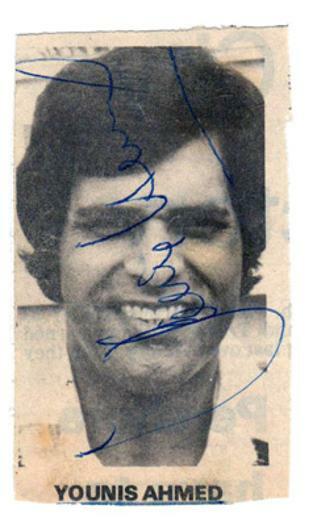 + a number of autographed pages & pics inside. 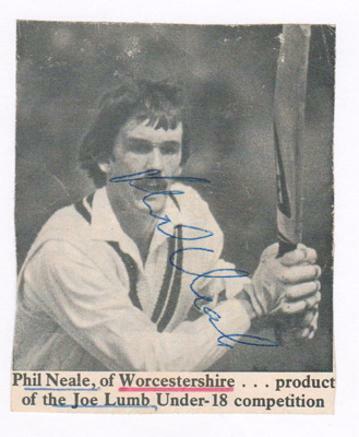 Signed B&W book page pic playing for NZ against Northants CCC. 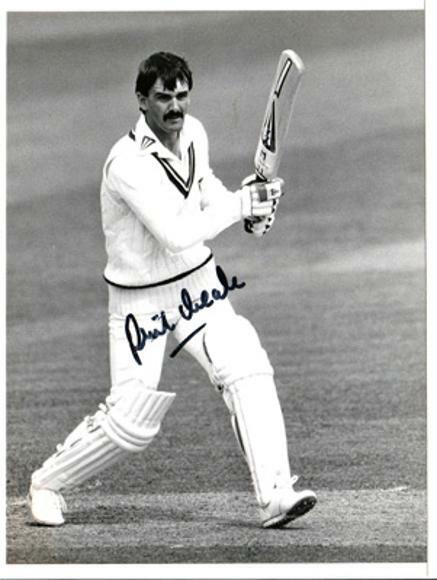 2 x Signed small B&W pics. 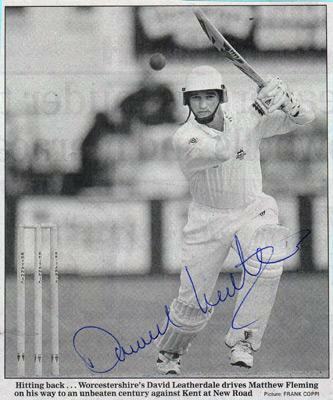 Signed B&W action pic - batting.